It's the Mass Effect Marathon For Charity! 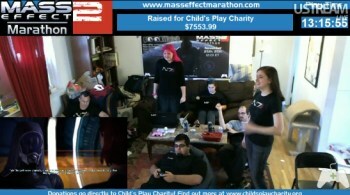 G33kwatch is holding an all-weekend-long Mass Effect Marathon to raise money for Child's Play. Good news for those of you who just can't get enough of watching other people play videogames for charity! The gang at G33kwatch is holding the Mass Effect Marathon 2, which is pretty much exactly what it sounds like: they're going to play Mass Effect 1 and 2 non-stop for the entire weekend in order to drum up donations for Child's Play. And yes, it's Mass Effect Marathon 2, not Mass Effect 2 Marathon; the original Mass Effect Marathon went down in November 2010 and raised over $14,000. There's more to it than just Mass Effect, though. Requests are taken for things like eating gross foods or having participants punch each other [presumably not in the face] and there are also celebrity call-ins, including one tomorrow [that's Saturday] at 12:30 PM EST from The Escapist's very own Miracle of Sound man Gavin Dunne. Those who donate will also be entered into raffles for some awesome prizes, including the Space Hamster Origin Story Pack, the We Are Tired Zombies pack and the Mass Effect Autograph-a-Palooza. There are some damn fine items up for auction, too. It looks like last year's total will be easily bypassed this year; the team has been playing for roughly 13 hours at the time of writing and has already raised over $7500, more than half of last year's total and well on the way to this year's goal of $30,000. Nice job, guys! Thanks to shado_temple for the tip.